Songs of Eretz Poetry Review is pleased to present “Of Bees and Summer” by Carol Hamilton, Poet of the Month. Ms. Hamilton will also be serving as the guest judge for the Songs of Eretz Poetry Award Contest, which will run from September 1 to October 15, 2015. A detailed biography of Ms. Hamilton may be found here: http://eretzsongs.blogspot.com/2015/08/songs-of-eretz-poetry-review-poet-of.html. The contest guidelines may be previewed here: http://eretzsongs.blogspot.com/p/songs-of-eretz.html. a green tunnel of cucumber vines. but their attacks were all mock. comes when we have nearly given up. 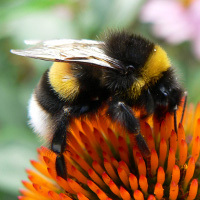 Poet’s Notes: What a joyous summer it was when all kinds of bees came to work with me under the cucumber trellises. The neighbors became wary of my approach with more and more cucumbers. A friend did indeed tell me of growing up with beehives and how friendly one might become with this community life. That would be lovely, but I was happy just to share our productive tasks. In this, like most poems, I had no idea where the poem was going when I started. Then remembering the friend’s comment led me on to the development of the “relationship” that brought delight and production for me and production for the bees as well. Editor’s Note: I imagine that Beorn from The Hobbit would have liked this poem, as would have the character’s creator. “Of Bees and Summer” was originally published in Illya’s Honey.